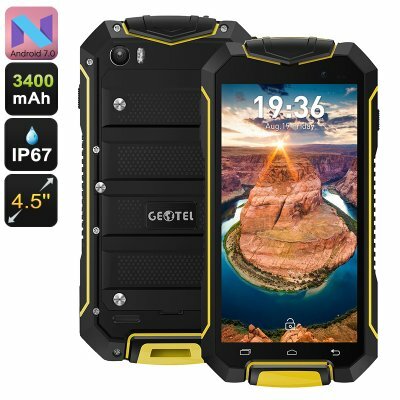 Successfully Added Geotel A1 Rugged Smartphone - Quad-Core CPU, Android 7.0, Dual-IMEI, 3400mAh, IP67, 4.5 Inch Display, 8MP Camera (Yellow) to your Shopping Cart. The Geotel A1 is a fully rugged Android phone that does not only feature an extremely durable design but also comes packed with the latest software the mobile industry has to offer. Running on the brand new Android 7.0 operating system, this Chinese smartphone will provide an exceptionally smooth and powerful performance. Supporting the latest features, this Android 7.0 smartphone is guaranteed to deliver a user experience like no other. Thanks to its fully rugged body the Geotel A1 features an IP67 design that allows you to enjoy all this Android smartphone has to offer no matter where you’re at. Whether you’re in the comfort of your own living room or exploring the remote outdoors during one of your upcoming adventures – this rugged smartphone will follow you wherever you go. Featuring a sophisticated 4.5-Inch display, the Geotel A1 rugged phone allows you to enjoy all your favorite media on the go. No matter where your next adventure will take you, this 4.5-Inch Chinese smartphone lets you watch movies, play games, and enjoy all the latest Android 7.0 features at any time – assuring that you’ll never have to be bored again. Packing an epic 3400mAh battery, the Geotel A1 provides you with up to 6 hours of continuous usage time and a mind blowing 120 hours of standby time – allowing you to get through multiple days of average smartphone usage without ever needing to worry about running out of juice. With its powerful Quad-Core CPU that has been clocked at 1.3GHz, this Android smartphone is capable of running the latest mobile applications, media, and games. Supporting up to 64GB of external memory, you can be assured that with the Geotel A1 at hand there will always be enough space for you to store all your media and files alike. Further increasing your mobile media experience is the phone’s ARM Mali0400 graphic unit that supports stunning detail and graphics while enjoying the latest games and movies – providing you with a truly cinematic experience whenever you turn on your device. So head out to the play store and get access to some of the latest free to download applications. This rugged smartphone lets you carry along days’ worth of your favorite media and games at any time – allowing you to stay entertained even while located in the most remote areas of the globe. Supporting two SIM card slots and dual-IMEI numbers, this Dual-SIM smartphone takes your connectivity to the next level. From now on you’ll always be able to insert a local foreign SIM card into your smartphone while traveling abroad, allowing you to stay connected to the web at local fees while, simultaneously, staying reachable to friends and family back home on your old and trusted domestic phone number. Additionally, the Geotel A1 also features a beautiful 8MP camera that lets you snap breathtaking images during your upcoming holidays. This allows you to share and recall all your foreign adventures with your loved ones back home once you have returned from your upcoming holiday. The Geotel A1 rugged phone comes with a 12 months warranty, brought to you by the leader in electronic devices as well as wholesale electronic gadgets..
Arabic: - الروبوت الذكي 7.0 - Chinese Simplified: - Android 智能手机 7.0 - Czech: - Android Smartphone 7.0 - Dutch: - Android-Smartphone 7.0 - French: - Smartphone Android 7.0 - German: - Android 7.0 Smartphone - Hebrew: - הטלפון החכם אנדרואיד 7.0 - Hindi: - एंड्रॉयड स्मार्टफोन 7.0 - Hungarian: - Android okostelefon 7.0 - Italian: - Smartphone Android 7.0 - Japanese: - 7.0 の android スマート フォン - Korean: - 안 드 로이드 스마트폰 7.0 - Malay: - Telefon pintar Android versi 7.0 - Norwegian Bokmål: - Android Smartphone 7.0 - Romanian: - Android Smartphone 7.0 - Russian: - Android смартфон 7.0 - Spanish: - Smartphone Android 7.0 - Thai: - สมาร์ทโฟน android 7.0 - Turkish: - Android Smartphone 7.0 - Vietnamese: - Điện thoại thông minh Android 7.0.